A large wooden hand stained a dull red, with a propeller in its palm. Sited above the river bank in a privately owned shipyard, this work is visible both from the road outside and the bank of the Tyne in North Tyneside opposite. Designed in collaboration with pupils from St. Peter and St. Paul’s Roman Catholic Primary School, the wood was saved from demolition of Sunderland's riverside. 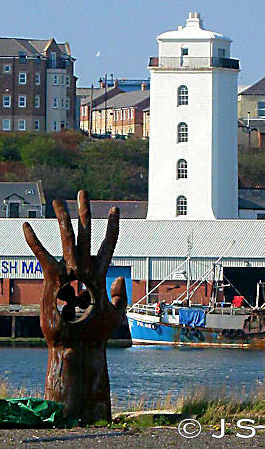 The Hand is ‘meant to be a symbolic greeting’ to ships entering the River Tyne. The work is part of the 'Art on the Riverside' scheme, and was commissioned by the Customs House Charitable Trust on behalf of the Council. The company on whose land the work stands may incorporate the Hand in its paperwork as a new logo. Members of the public will usually be admitted to the yard to see the work if they ask at the gate first.